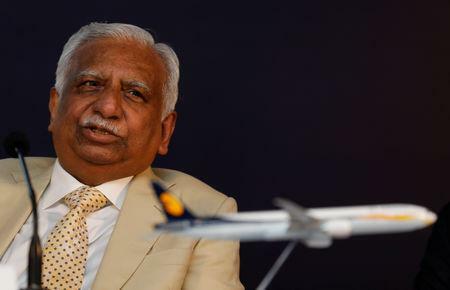 NEW DELHI (Reuters) - Jet Airways' Chairman Naresh Goyal told the airline's pilots on Monday he needed "a further short time" to finalise a rescue deal for the cash-strapped Indian carrier as the process is complex. In a letter, Goyal said he was "committed to have the process completed as soon as possible and restore much needed stability" to the airline's operations, and that he would make it a top priority to settle delayed salary payments for pilots and some other staff once a deal is finalised. He also said talks for the rescue deal with the airline's biggest shareholder, Etihad Airways, and lenders, led by State Bank of India (SBI), were ongoing. Reuters has reviewed the contents of the letter. Etihad, in a separate statement, said on Monday it was working with Indian lenders and Jet Airways on a solution for the airline. Saddled with more than one billion dollars of debt, Jet is struggling to stay afloat. It has delayed payments to banks, suppliers, pilots and lessors - some of which have forced the airline to ground as many as 40 planes.